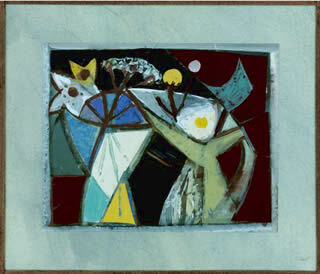 Flowers were a subject which pre-occupied Guthrie from the mid 1930's to the late 1960's. During the 1960's she produced a series of "Flowerscapes" in a Neo Romantic vien. Framed in a hand coloured glazed mount. Trained at the Slade School of Art under Myles Tonks, and married to fellow painter Robin Guthrie, Kathleen Guthrie’s pre-war work is firmly figurative. 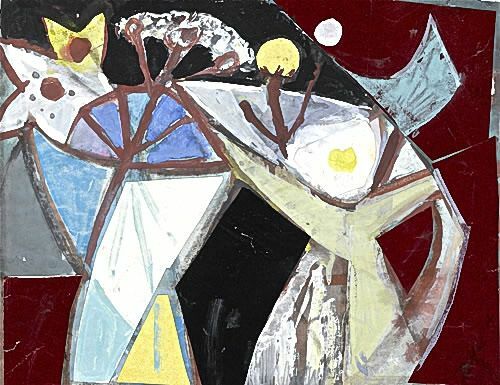 Her abstract painting dates to the post-war period, after she had divorced Guthrie and married the painter Cecil Stephenson in 1941. 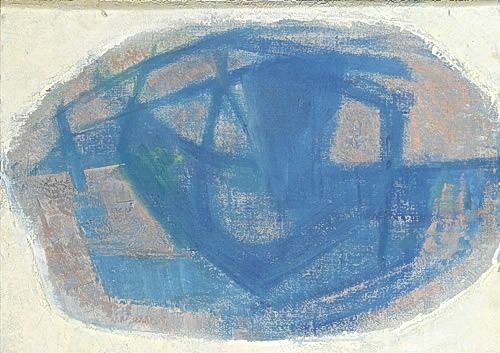 Although clearly influenced by Stephenson, she retained a distinctive luminous, soft palette, and her brushwork remained very consistent, avoiding the hard edges and sometimes vigorous impasto of his work. A solo exhibition of her work was held at the Drian Gallery in London in 1966, in which these works are likely to have been included. We are grateful to Marjorie Guthrie for her assistance.